From the ridiculous to the sublime, I work on the wheel – an experience initially so like sticking your hand up a cows bottom, but also, by contrast to this vulgarity, a transportation that results in finding yourself playing a rhapsody on a finely tuned instrument. I strive to produce the sublime. The ridiculous is very often what I am left with. Pam enjoys using a variety of media. She draws, paints, collages and throws vessels on the wheel, often carving into the resulting forms to create sculptural pieces. 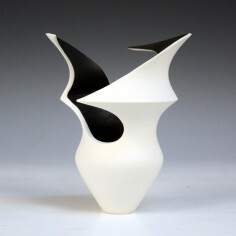 Her ceramic work reveals an interest in the human figure, stillness and movement, music and dance.